Remove chipotle peppers from Adobo sauce in can. Cut off stems, slit down the center, and scrape out the seeds. Then dice them finely. Dice onion and add to a medium pot with olive oil over medium heat. Cook until onion starts to soften, about 3 minutes. Stir in diced chipotle peppers. Remove husks from corn and slice off kernels. It helps to place the ear in a bowl as you cut so the kernels fall in the bowl and don't scatter everywhere. When onions and peppers have cooked for a minute or two, stir in all the fresh corn along with a cup of water. Cook partially covered, for 10 minutes, lightly steaming the corn. When the water is evaporated, add cream and milk and turn heat down to medium low. Stir regularly and cook until milk and cream cook down and thicken. Season with salt. You can serve this immediately or keep it warm over low heat. If it gets too thick, thin with a bit more milk. Sometimes a side dish can be the highlight of a meal. 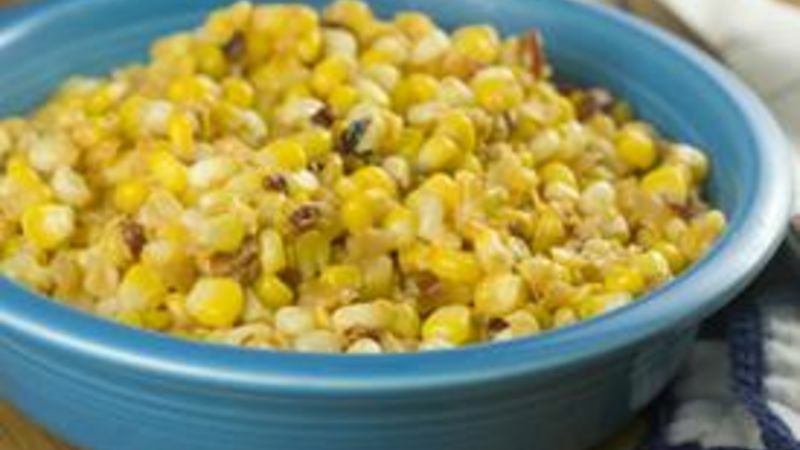 Sometimes something as simple as fresh corn with just a few other ingredients can turn into something almost magical. I think one of the reasons why this recipe is so good is that when most people think of creamed corn they think of the canned stuff. That can save time, but creamed corn made with fresh corn will take people by surprise! To spice up and complement the corn, I like to add a few chipotle peppers to the mix. If you don’t like spicy stuff, you can leave them out or cut back on them a bit. I like that this Chipotle Creamed Corn has a bit of a kick to it and isn’t overly creamy. The star is still the fresh corn, which you should be able to find this time of year! If you’ve ever tried to cut fresh corn off the cob, you know it can be frustrating. As you slice the corn, it just scatters in all directions. To solve this problem, I rip the husks off my corn and cut it while the cob sits in a bowl. Then as the kernels come off they fall in the bowl and not all over my kitchen. This recipe makes a good amount of creamed corn, but a general rule is one corn cob per person or serving. If you aren’t familiar with chipotle peppers you can usually find them canned in Adobo sauce in the Latin section of your supermarket. They are smoked jalapenos so they have some really deep flavor and are pretty spicy. I like to add a bunch to my creamed corn, but feel free to start with just one or two if you’re worried about the heat. As you pull them out of the sauce, be sure to cut off the stems and remove the seeds. They will be a bit messy, but it’s worth the work. Speaking of the sauce, the stuff that they store the peppers in is really flavorful. It’s a strong peppery mix and has great flavor. I recommend adding a spoonful of this to your creamed corn also. When you’re ready to start cooking the creamed corn, add the olive oil to a medium pot along with the onions. Cook that for a few minutes over medium heat until the onions start to soften. Then stir in your chipotle peppers and Adobo sauce. Cook this down for a few minutes and then stir in all your corn along with about a cup of water. It might not make sense to add water, but it helps to steam the corn before we add the cream. So add the water and cook the corn for a few minutes until all the water is evaporated. It’ll take about 10 minutes. Then you can go ahead and stir in your cream and milk. You could use all cream if you wanted, but I like a slightly lighter version. Turn the heat down to low at this point since you don’t want to scald the cream. Cook this for another 5-8 minutes until the cream starts to thicken. Then get out your favorite masher and just lightly mash the corn. This will thicken the dish even further. Season the corn with a pinch of salt and you can serve it immediately or keep it warm on low heat until you need it. If you let it stay warm for too long, you’ll need to stir in some extra milk if it gets really thick. I’ve never had creamed corn this good. It’s spicy and sweet, but not too sweet. The next time you are having a BBQ or just want a side dish that shines, give this a shot! Nick served this with a grilled steak and potatoes and it was heavenly. Be sure to check out his blog, Macheesmo, his book Cornerstone Cooking and his Tablespoon profile.